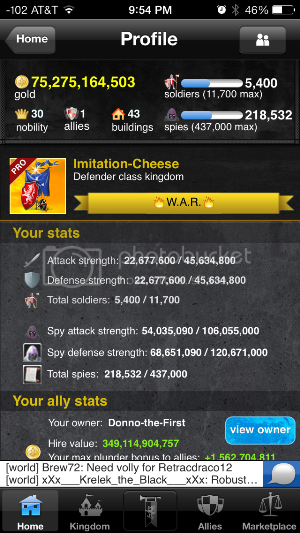 Spies are a type of unit that can be used to perform attack and defense actions. They cannot be used in quests. Look at all that info! The first two parts are pretty much self explanatory, but look at that third part - the one in yellow. 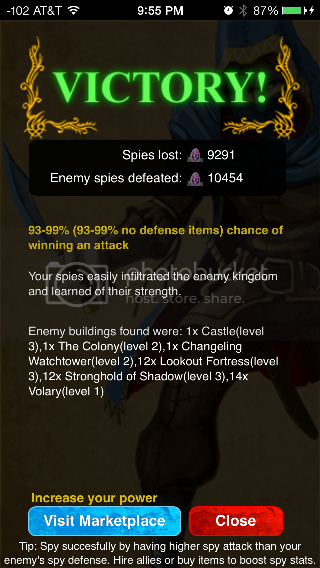 "93-99% (93-99% no defense items) chance of winning an attack. This is tremendously useful information, especially when choosing your target or trying to find the best time to strike. The percent chance of winning an attack here means attacking with your troops, not spies. The next line tells you about your spy strength relative to your target's spy strength. It says "Your spies easily infiltrated the enemy kingdom and learned of their strength." Other times, you might see something like "Your spies barely managed to ..." This means you got lucky and won your spy attack. If it says "Your spies easily..." that means if you spy again, you'll probably succeed. The last part is probably the most valuable piece of information - it's a picture of your enemy's kingdom! It tells you the level of their castle as well as the number and level of every building in their kingdom. You can use this information to find develop exploits in your target's build. Always scout new targets first to size them up. Scouting only takes a very small number of spies, so it's very cheap and easy to size your target up. You can usually scout your opponent up to 42 times per fully bar of spies. Stealing is very expensive. You'll only be able to steal your opponent between 12 and 16 times per full bar of spies. It also does very little damage to your opponent. They lose a lower percentage of spies than you. Stealing usually gets you less gold per action compared to attacks. This effect is especially pronounced as your spy levels decrease - you'll get even less gold per successful action. At the same time, your opponent only loses (roughly) 0.2% of their gold out per steal. Steals don't benefit you much, and they don't hurt your opponent very much. But there are some key advantages to the steal that will be discussed in more detail in the fight mechanics section. The first two sections are self-explanatory. The last two parts give you crucial information. 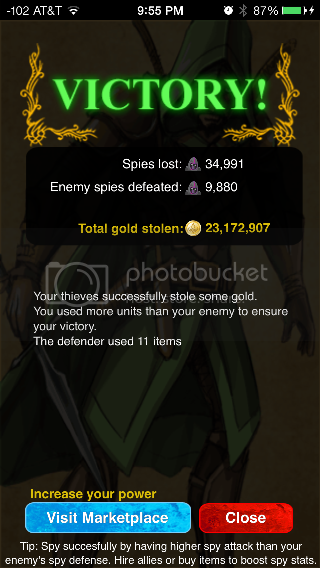 The part where it says "Your thieves successfully stole some gold" tells you how likely you are to win another steal without having to scout them. If it just says "your thieves succesfully..." that means you have roughly a 50% chance of winning another steal. If it says "Your thieves easily..." that means you have at least a 75% chance of winning the next steal. Finally, if it says "Your thieves barely..." that means you'll probably fail the next steal. The very last line tells you how many different defense spy pots your opponent has. It won't tell you how may more they have in reserve, but it at least gives you an indication of as to the variety of pots your opponent has. As of the writing of this post, the max possible defense pots is 11, so this target would be considered "potted." If the number were 10 or less, chances are your opponent doesn't have many pots in reserve, and you'll likely burn through whatever spy defense pots they have very quickly. The top section is self-explanatory. Similar to scouts and steals, take notice of the part where it says "Your assassins successfully killed enemy soliders." This means you have roughtly 50% chance of winning the next assassination. If it said "Your assassins easily..." that means you have a roughly 75% chance of winning the next assassination. Finally, if it says "your assassins barely manged to..." that means your next attempt will likely fail. Occasionally, you'll see the message "your assassins managed to invade the well fortified enemy camp." This means you got extremely lucky and shouldn't have won the attack, and your next attempt will likely fail. You can also see how many SDP types your target has. As above, this target is "potted." At the very bottom, you get a half-snapshot of the enemy kingdom... sort of... 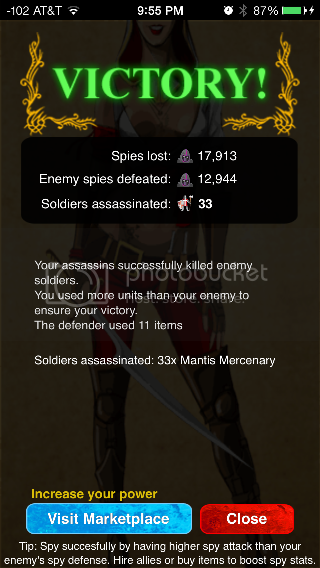 It says "Soldiers assassinated: 33x Mantis Mercenary. If you look at Wulf's Building Guide, you'll see that Mantis Mercenary are the troops your opponent gets from level 2 Colonies, which are T5 balanced troop buildings. This tells you that your opponent has balanced T5 lvl 2 troop buildings. In all cases, if you fail the attack, take a look at the Defeat screen and look for what it says about your attack. If the message says something like "your opponent barely managed to..." you will probably win the next attack. If it says something like "your opponent easily..." then you will probably continue to lose attacks against that kingdom. Last edited by Imitation-Cheese on Jan 27 2014, 11:49pm, edited 3 times in total. Troops can be used in quests, EBs, wars, and PVP. They earn plunder with successful actions. Unlike spy actions, they also earn you ally plunder. Take a look at the SS below. 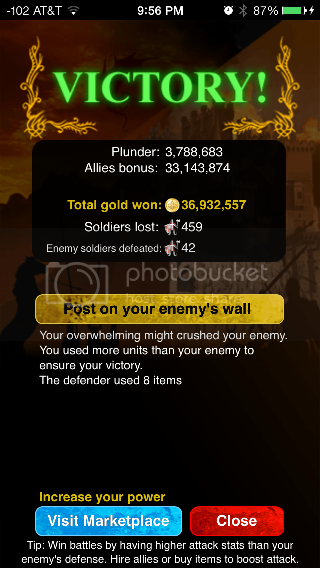 Your total gold won is the sum of troop plunder and allies bonus. The rest of the top section is self-explanatory. The next section tells you about how likely you are to win the next attack. In this case, it says "Your overwhelming might crushed your enemy." This means that you will probably win your next attack. If it says something like "you troops barely managed to..." then you will probably fail your next attack. Similarly, if the message says something like "your opponent barely managed to..." you will probably win the next attack. After that, it says "you used more units than your enemy to ensure your victory." This just means your build has more troops than it needs to secure your victory, which is good for you. Finally, you get a report of the number of TDP your target has. This target isn't fully potted, so repeated attacks will likely deplete their TDP lower. Last edited by Imitation-Cheese on Jan 27 2014, 11:48pm, edited 2 times in total. Towers are great for defense. Their stat bonus is static. This means that as your troop/spy levels deplete, your tower defense bonus stays the same. This makes you very powerful against enemy attacks. The downside is that towers do not boost your plunder bonus in any category. This means you'll earn less plunder for your attacks as a tradeoff for your powerful defensive strength. Most "war builds" will use towers because war builds tend to get attacked quite a bit. So naturally, they want to minimize their losses, and what better way to do that than to have a strong static defense? Last edited by Imitation-Cheese on Jan 27 2014, 11:53pm, edited 2 times in total. Q What are bronze bars? A Bronze bars are KaW's bank. They cannot be "burned" by opponents, and you can sell them at any time for a 75% refund. Q What are they good for? A Bronze bars can be used to cash in large sums of gold for purchasing allies, buying/upgrading buildings, and/or enchanting certain items. Q How do I get bronze bars? A They can be purchased at the marketplace. They are also given for free as drops from FoD, SR, TGL, and a few other EBs. Q How much will I get if I sell them? Last edited by Imitation-Cheese on Jan 30 2014, 2:06am, edited 5 times in total. Q How can I earn Mithril? A Mithril can be purchased from the Oracle (6 mithril max), or it can be earned by winning wars. Last edited by Imitation-Cheese on Jan 30 2014, 2:07am, edited 5 times in total. Q Who is the strongest player in KaW? A This changes occasionally, so check the player leaderboards to find out. Q How do I find my leaderboard rank? 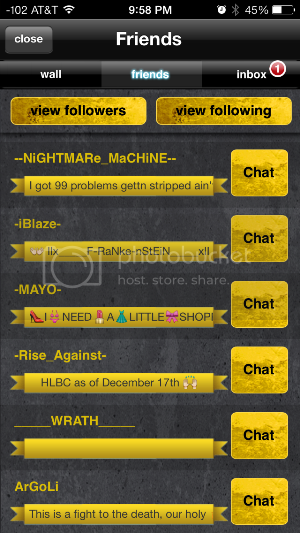 A Select the "leaders" button on your home screen and select any category for which you'd like to know your rank. If it says "unranked," that means your rank is less than 1,000. Q What is the clan leaderboard? A This is a list of the strongest clans in KaW. Q What is the prestige leaderboard? A This is a list of the clans with the most war wins. A Prestige is a measure of a clan's ability to win system wars. Last edited by Imitation-Cheese on Jan 30 2014, 2:21am, edited 4 times in total. Q What does CS mean? A CS refers to the sum of your BTO. Q How do I find my stats? A Open your profile and scroll down until you see "your stats"
Q What’s the difference between raw stats and CS? A Raw stats are what you see in the "your stats" picture above. CS is the sum of your BTO. To find your BTO, divide your stats by 50. To find another player's stats, multiply their BTO by 50. Last edited by Imitation-Cheese on Jan 30 2014, 2:27am, edited 2 times in total. Q I found a bug. How do I report it? A Send feedback using the in-game feedback button located at the bottom of the home screen or send an email to support@athinkingape.com. I tried to make a purchase, but it won’t work! Last edited by Imitation-Cheese on Jan 30 2014, 2:28am, edited 2 times in total. How do I transfer/link my account? Last edited by Imitation-Cheese on Jan 18 2014, 3:28am, edited 1 time in total. Q How do I become friends with someone? A Open their profile and tap "follow." If they follow you back, you'll be friends. If they don't follow back, they may have missed your follow request, so you may want to post on their wall to remind them to follow back. Q How do I unfriend someone? A Open their profile, scroll to the bottom, and select "unfollow." You can also find the unfollow button in your followers list. Here's the friends menu, which you can find by tapping on the icon at the top, right corner of your screen. Once you find this, tap on the person you want to unfollow, scroll to the bottom of their profile, and tap on "unfollow." Last edited by Imitation-Cheese on Jan 30 2014, 2:28am, edited 6 times in total.